Many have searched for the legendary Fountain of Youth, but none have found it. Click here to play! .. Until today. Following a map made by the famed occultist Randall Havermann, you journeyed into the depths of the Amazon rainforest and found the Garden of the Golden Palace, told to be the location of the Fountain of Youth. There is something strange and wonderful about this garden. Blue birds twitter with a soothing melody, the croaking of frogs seeming to provide a bass line. Butterflies with extravagant patterns on their wings fly by, and you know that this may be the first time a human has seen these wondrous creatures in hundreds or thousands of years. As you walk along, you can feel your eyes being pulled to the left, as if something calls to you. You drop to your knees as, surrounded by exquisite white flowers, you see the Fountain of Youth. In fact, you see two more set slightly further back from the first. Three Fountains of Youth to be drawn from. 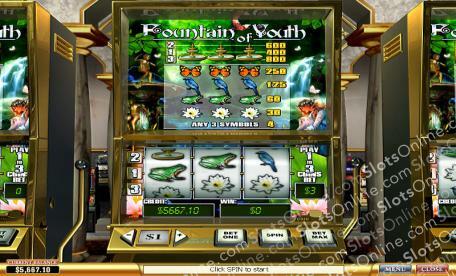 The Fountain of Youth will lavishly reward the adventurer who finds it, so start your search today!